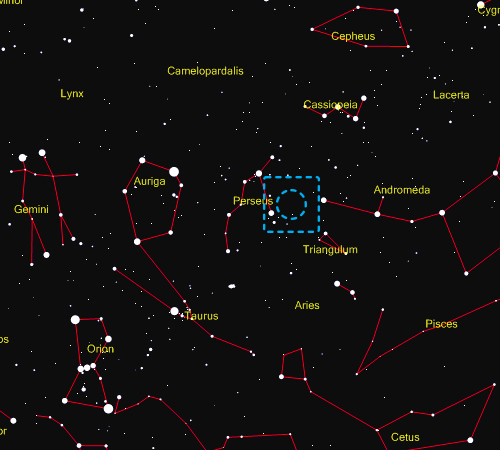 Draw a line between the star Algol in Perseus and the star Almach at the eastern end of Andromeda, look just above this line about half way along with a pair of binoculars and you will make out the delightful open cluster that is Messier 34. It is known as the Spiral Cluster, which is more evident when viewed visually than in this image. 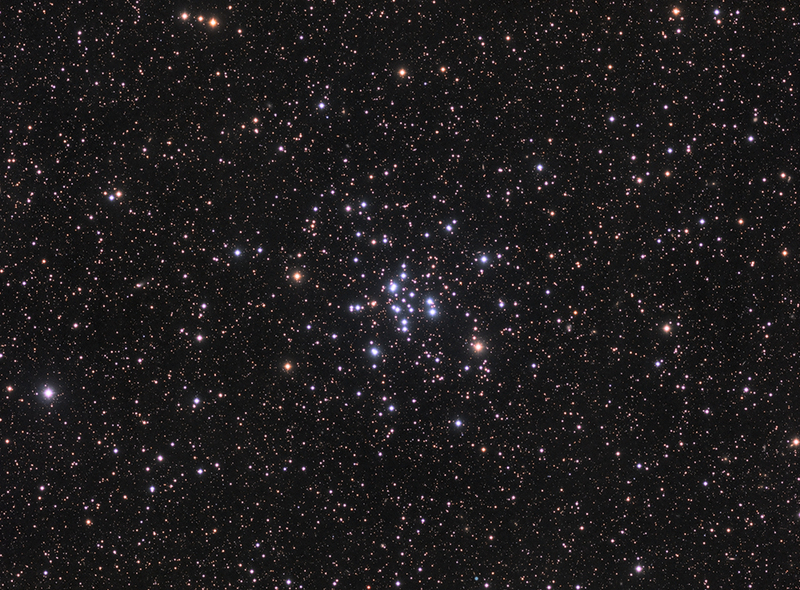 Messier 34 was first observed around 1654 by Giovanni Hodierna; Charles Messier added it to his famous catalogue in 1764, describing it as "a cluster of small stars a little below the parallel of γ (Andromedae). In an ordinary telescope of 3 feet one can distinguish the stars.". At 1500 light years from Earth, it is one of the closest Messier objects to us, with only six other objects, including the Pleiades, the Beehive Cluster and the Orion Nebula, being closer to us. The cluster contains between one hundred and four hundred stars that are in the range of 0.12 to 1.0 solar masses. The age of the cluster is somewhere between that of the Pleiades at 100 million years and the Hyades at 800 million years. Comparisons between the observed stellar spectra and the values predicted by stellar evolutionary models give an age estimate of 200–250 million years. This is roughly the age at which 0.5 solar mass stars enter the main sequence. By comparison stars like the Sun enter the main sequence after about 30 million years. The cluster is also home to at least nineteen white dwarfs, stars that have reached the end of the main sequence, stopped nuclear fusion and expelled their outer shells of matter as a planetary nebula. Messier 34 has an unusually high metallicity compared to the Sun, meaning that the ratio of iron to hydrogen is high; it includes high concentrations of many other metals too, though nickel is relatively underabundant. Messier 34 is classified as Trumpler type I 3 m, which means that it is detached from the surrounding field and has a strong central concentration (I), it contains both bright and faint stars (3), and is medium rich in star number. In 1983, scientists discovered that the spatial motion of M34 coincided with that of the Pleiades cluster (M45) in Taurus, the open cluster NGC 2516 and the Southern Pleiades (Theta Carinae Cluster, IC 2602) in Carina, the Delta Lyrae Cluster (Stephenson I) in Lyra, and the Alpha Persei Cluster in Perseus. American astronomer Olin J. Eggen, who made the discovery, called this group of open clusters the Local Association. The stars in these clusters share a common age and place of origin.